I am not understanding what it means by "converting to external output", does that mean that I might be on the right track using an HDMI adapter converting the VGA connector to HDMI, is that what this might be referring to please? 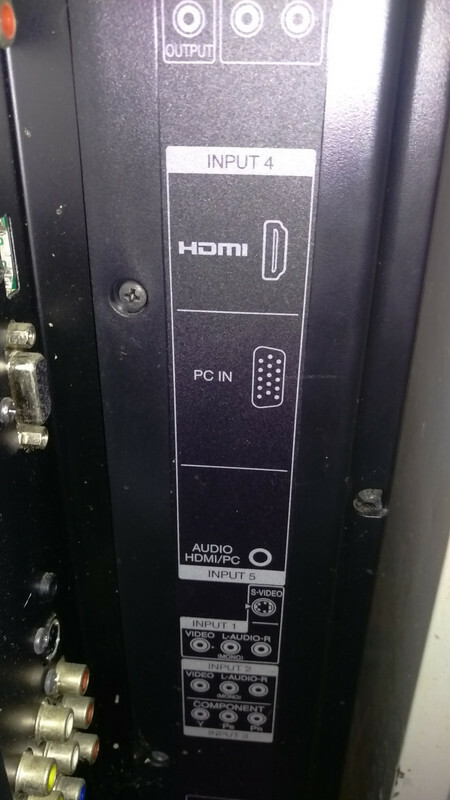 I was simply thinking that since the HDMI input is working on the TV then it might work to convert the VGA connector on the PC to hdmi, help please? Your links are cropped off and so not working. You could buy the cheapest GPU out there to gain a true HDMI output. Like a "EVGA GeForce 210 Passive 1024 MB" on Amazon. $33 and not have to do any digital --> analog ---> digital conversions. Last edited by KarMa; 18th Jan 2019 at 10:57. What problems did you experience when you tried using the TV's VGA connection plus input 5 for audio? VGA should work fine for watching video files with the PC set up to output at 1360 x 768 resolution, as long as HDCP is not required. HDMI + HDCP are required only for watching commercial streaming services like Netflix or for playing commercial Blu-ray and DVD discs with PowerDVD. ...and if there is an HDCP requirement for what you want to watch, using a VGA to HDMI converter won't help because you would still be using a VGA connection on the computer, which cannot provide HDCP. Last edited by usually_quiet; 18th Jan 2019 at 11:34. 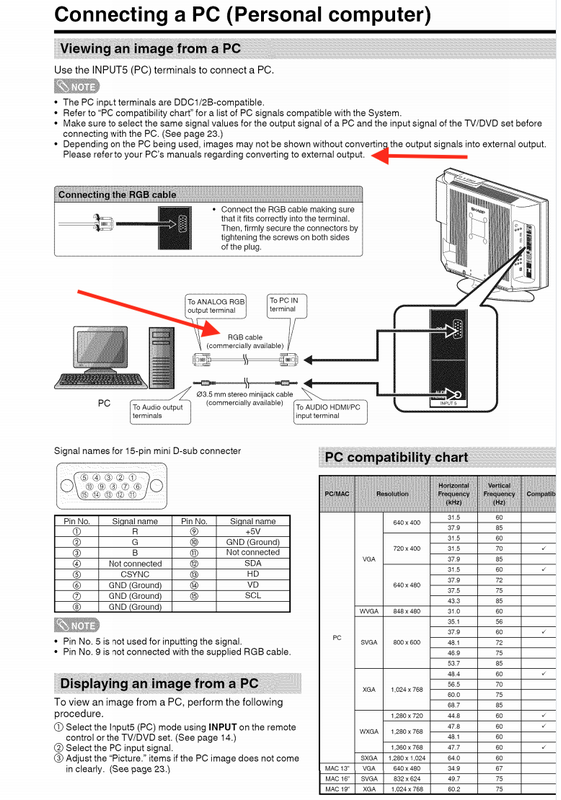 Page 24 of the manual you linked to says Input 5 is for the VGA connection. Tech support can be mistaken sometimes. The picture that you posted also shows "Input 5". Did you try using input 5 with VGA connected and the PC set up to output at 1360 x 768? Is your graphics adapter sending one of the supported VGA modes listed on Page 24 of the manual? So I tried Inputs 4 and 5 and tried the different options selecting "Extend and Duplicate" but no signal. Are those the 2 options you mean by "VGA modes" please? No to both posts. Unfortunately guys, I can't experiment more with what you've written until Monday so can get back to you then, appreciate the help and have a great /we, thanks! Well, if your PC is not sending one of the graphics modes supported by the display, that sort of explains why you are getting no picture. For example, the typical PC resolution of 1920x1080 at 60 Hz is not supported by that TV. Oh, so I should try all of the different Res options to see which one works? I suggested 1360 x 768 because it's the closet supported resolution to the TV's native resolution (1366 x 768). You would also choose 60Hz as the refresh rate. I don't have your TV, but in the past, I successfully connected two different 720p TVs to a computer via their VGA port using that very same resolution and refresh rate. Doesn't work guys. Started from the max 1440x900 and worked down to 800x600 on both Inputs 4 and 5. Best I simply get the VGA to HDMI connector I had linked to in my OP? The PC/laptop screen may not support all the same resolutions that the TV's VGA connection supports. You should extend your desktop to use the TV as a second display during your tests. The second display can then be set to a different resolution than the PC/ laptop screen. 1440 x 900 is not listed as a supported resolution in the chart for your TV. Restrict your tests to resolutions and refresh rates in the posted chart with a check mark in the supported column and set the TV to Input 5. There are two pages in the manual that you linked to which say Input 5 should be used for the VGA connection, pages 24 and 36. I am certain that Sharp tech support was incorrect to tell you to use Input 4 for VGA. It isn't a sure fix. You are still required to set up your VGA port to output a resolution and refresh rate that the adapter will accept. You may still have difficulty doing that. Yes, work your way down from highest to lowest rez. Thanks guys, I can only attempt this tomorrow sometime, will get back to you. So then best I simply get another regular pc monitor then. 1. What will you do about audio? Do you already have speakers or headphones for your PC? PC monitors often lack speakers and if they have speakers those are often worse than a TV's speakers. 2. Like your TV, the VGA connection on PC monitors also have a list of supported resolutions and refresh rates too, plus one preferred resolution and refresh rate. Before going that route you need to make sure that your PC's VGA connection supports the monitor's preferred resolution and refresh rate. 3. If this PC is actually a laptop, you may need to disable its screen in order to use video player software in full screen mode. [Edit] I see you posted about having an iMac. What kind of PC (make and model) are you planning to use for media playback, and what OS is it using? AFAIK, You don't say just what model of PC you have, so it's hard to gauge what it may or may not support. However, what usually_quiet has said is correct. I just checked out your manual. In4 is for HDMI, In5 is for VGA ("RGB") + 1/8"mini (analog) audio). Same with the native rez of the TV, same with the suggestion to use "extended desktop" so as to not force a common size between it and your PC's existing screen. Very likely you will find a workable rez if you try again with that in mind. However, you may just want to get a different card for your pc that supports DP and/or HDMI (unless you've got a laptop, in which case...time to upgrade?). Most Macs from recent era support Thunderbolt (or now USB-C/Tb3) which you can get adapter to DP or sometimes HDMI. BTW, DP->HDMI usually works easily & passively because many DP ports are actually DP++ (hybrid) ports which means they can do double duty for either HDMI or DP, just needing the proper adapter cable. Non-DP++ is more difficult to convert to HDMI, but still possible, though it requires some active conversion of the DP signal to equivalent HDMI signal (timing, packets, protocols are different, though). VGA->HDMI is a different beast. VGA is ANALOG, HDMI is DIGITAL. You not only need an Analog->Digital converter section, but you need to make sure the scan & rez are in the list of allowable HDMI signals - while it has a large assortment, NOT EVERY analog signal (VGA or otherwise) is compatible. How to achieve this? Using phone data to browse and watch videos.